WILMINGTON, Mass.– An expanded line of metric shaft collars, couplings, and mounting components from Stafford Manufacturing Corp. is suited for use in mechanical drive systems and structural applications, Stafford said in a press release. More than 800 items are available in the expanded line, including the Grip & GoTM quick release handle, which can convert a standard shaft collar into a rapidly adjustable locating device, and Staff-LokTM Shaft Collars, which reposition without tools. Among the new items are flange shaft collars, face mounting collars, and heavy-duty shaft collars and couplings. Stafford's metric shaft components are available in 3 mm to 80 mm I.D. sizes and are offered in aluminum, steel, stainless steel, and thermoplastics, depending upon style. Standard metric items include set-screw, 1-piece, 2-piece, and hinged styles, along with couplings in 1-, 2-, and 3-piece styles, with or without keyways, and inch-metric shaft couplings and adapters, the release said. 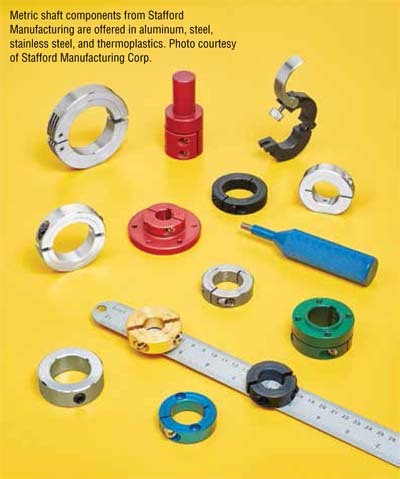 Stafford Manufacturing Corp. (www.staffordmfg.com) is an ISO 9001:2008 certified manufacturer of shaft collars, couplings, and specialized mechanical drive and structural components. In addition to more than 4,000 catalog parts, Stafford manufactures problem-solving parts for leading OEMs, contract manufacturers, and industrial distributors. The company's engineered mechanical components are found in numerous types of equipment, including conveyors, packaging machinery, processing equipment, recreational products, medical instruments, storage systems, and consumer goods.